At the Law Office of James A. Podgorny, we provide an aggressive approach designed to get the results our clients expect. In divorce, that means intense negotiation on issues of child custody and visitation, child support, spousal support, and property division. We bring the same focus to family law matters, including paternity, adoption, prenuptial and postnuptial agreements, and domestic violence orders of protection. We will also serve as a guardian ad litem and child representative for the Circuit Court of Cook County in the near future. In addition to divorce and family law, we offer skilled and experienced representation in real estate closings, civil litigation, and personal injury cases. Whatever your legal need, we are ready to help. The divorce process is difficult, but we strive to reduce your burden as you prepare for life's next chapter. Learn about paternity, adoption, prenuptial and postnuptial agreements, orders of protection, and more. Residential and business property buyers and sellers require an attorney to ensure they are protected. We assist victims of auto, pedestrian, slip-and-fall, dog bite, workplace, and food poisoning injuries. Deciding to file for divorce is among the toughest situations a person can face, as is receiving legal notification of that decision as an unsuspecting spouse. You may feel like your life has been turned upside down, and you may have no idea what tomorrow will bring. The Law Office of James A. Podgorny can help you take that first step toward reclaimed stability. We will help you solve the most critical aspects of your divorce, including the allocation of parental responsibilities (custody) and parenting time (visitation), child support, spousal support (maintenance), and marital property division. We can negotiate an agreeable divorce settlement with your spouse or aggressively pursue a favorable divorce decree in court. Whatever your situation calls for, we can help. 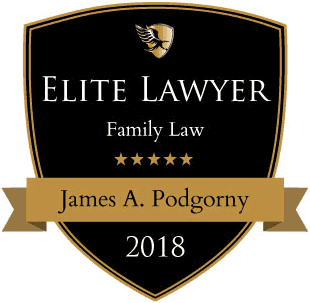 At the Law Office of James A. Podgorny, we understand the intense emotional conflicts and strenuous procedural hurdles that often accompany family legal issues. Adoption, establishing paternity, domestic violence orders of protection, divorce, child support, and parenting time (custody) all have their share of challenges. We strive to secure the outcome you need and to deflect much of the stress, as we provide steadfast legal counsel you can trust throughout your case. For those couples who wish to plan ahead for the possibility of divorce, we can help craft a detailed prenuptial or postnuptial agreement that protects your interests and your family's, especially for high-asset individuals, business owners, and couples with children from previous marriages. The purchase of a business or property for commercial use requires careful analysis. We help buyers determine if what they intend to buy fits their needs. If so, we help create a purchase offer that will not lead to complications after the sale. For sellers, we assess all reasonable requests for alterations prior to sale and examine the offer received to ensure you are protected. For most people, home sales and purchases are the biggest transactions they will ever be part of. Regardless of whether you are a home buyer or seller, you need a skilled real estate lawyer to ensure there are no future problems with your agreement. We can negotiate any repairs, mold and radon remediation, or drainage changes prior to sale, and we will make sure your contract is ironclad. If you were injured in an accident that was not your fault, call us to make sure your rights are protected and your health and financial needs are covered. Civil lawsuits are non-criminal cases in which one party seeks compensation from or requests action be taken by an individual or commercial business owner. Contract disputes make up a large portion of these cases, including disagreements over leases and service provider contracts. Civil suits also include real estate conflicts, employment and labor disagreements, and product liability cases. The majority of civil cases are settled long before they reach a courtroom, as the two sides come to a suitable arrangement to correct the issue that caused the initial dispute. Whether you want to file a civil lawsuit, or you were served a summons as part of one, we can examine the facts of your case to decide the course of action that best achieves the result you desire. From our office in Palos Heights, Illinois, we serve clients throughout the area, including but not limited to Bridgeview, Burbank, Oak Lawn, Chicago Ridge, Palos Hills, Hickory Hills, Palos Park, Alsip, Crestwood, Robbins, Blue Island, Midlothian, Oak Forest, Markham, Tinley Park, Orland Hills, Orland Park, Homer Glen, Joliet, Will County, DuPage County, and Cook County.